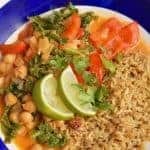 I love this easy chickpea curry – it’s quick and easy to make and packed full of flavour. The vegetables are also a pretty good way getting some more greenery in your life. Perfect for nights you need a good dinner in a hurry. Put the oil in a medium-sized saucepan and put on a medium heat. Crush the garlic and dice the onion – put both in the pan when the oil is hot and turn up the heat to cook down for a few minutes. Pop in the spices and tomato puree – stir together and add the stock, coconut water and the chickpeas. Bring back to the boil and cook for about five minutes. Turn off the heat and add in the kale. Cover and let it cook for about two minutes. Serve with brown rice, a couple of wedges of lime and a little coriander.